The Google Pixel 2 hasn't had the smoothest launch, what with all the reports trickling in about the unfortunate burn-in and muted colors on the Pixel 2 XL's plastic OLED display. To make matters worse, as spotted by Android Police, users on Reddit who ordered the "Clearly White" versions of the smaller Pixel 2 are reporting that they're receiving emails saying their orders have been delayed by a month. More precisely, the shortages appear to be affecting the 64 GB versions of the white device. The shipping dates were originally listed as today, October 23, but now Google claims the devices won't go out until November 23. 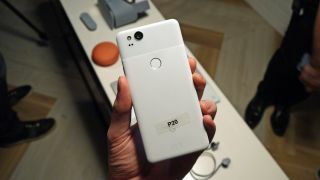 It's unclear at this time where the orders were due to ship, but with the white Pixel 2 available in the US and UK, there's a chance customers in both regions are affected. The white Pixel 2 releases in Australia on October 31. Fortunately, Google is reportedly trying to make amends for the shortage by offering affected users a code for a free Live Case for their troubles. If you're affected, there's a good chance you've already received an email from Google detailing your new ship date and Live Case code. If you ordered a white Pixel 2 and received nothing, rejoice, that probably means your phone will soon arrive as planned. We contacted Google for a statement about the alleged shortage, but have yet to receive a response.